If you look around in your church today, two-thirds of the young people who are sitting among us have already left in their hearts; soon they will be gone for good. The study found that we are losing our kids in elementary, middle school, and high school rather than college, and the “Sunday school syndrome” is contributing to the epidemic, rather than helping alleviate it. This is an alarming wake-up call for the church, showing how our programs and our approaches to Christian education are failing… and our children are paying the price. 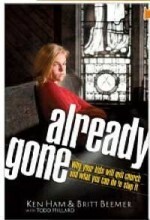 Though the statistics reveal a huge disconnect taking place between our children and their church experience, Already Gone shows how to fight back for our families, our churches, and our world. We can make a difference today that will affect the statistics of tomorrow in a positive and Christ-focused way! Two studies conducted by both the Barna Group and USA Today, found that nearly 75 percent of Christian young people leave the church after high school. One of the key reasons they do so is intellectual skepticism. This is a result of our youth not being taught the Bible in their homes or in church. Statistics show that our kids today spend an average of 30 hours per week in public schools where they are being taught ideas that are diametrically opposed to biblical truths, e.g., evolution, the acceptance of homosexuality, etc. Then they come home to another 30 hours per week in front of a TV bombarded by lewd commercials and raunchy sitcoms or “connecting” with friends on Facebook, staying online for hours, chatting with one another, or playing games. Whereas the time spent weekly in the church Bible classroom is 45 minutes. It’s no wonder that our young people leave the home without a Christian worldview.